There are two facilities for recruit training. They are called Marine Corps Recruit Depots (MCRDs) and are located in San Diego, California and Parris Island, South Carolina. 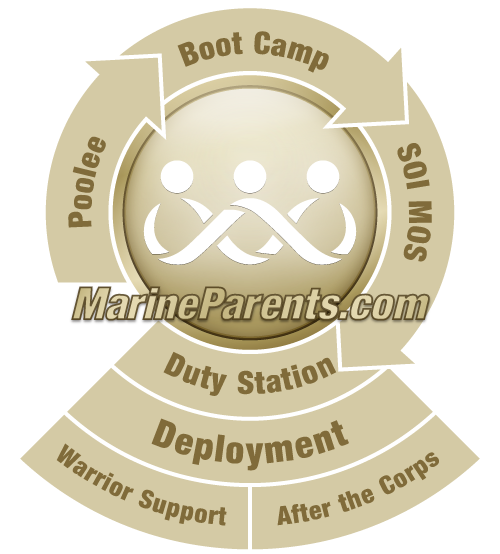 Their acronyms are MCRDSD and MCRDPI, respectively. Each MCRD includes Recruit Training Battalions, or RTBs. Each RTB has a color and crest associated with it. RTBs are divided into companies, and each company is divided further into platoons. Each platoon has a four-digit number. Each company runs a 13-week training schedule and graduate on the same day. A battalion is identified by number, 1-4. Each company is identified by a letter in alphabetical order. The platoon is identified by a four-digit number, with the first number indicating which battalion they are from. Colonel Jim G. Gruny (left), commanding officer, Recruit Training Regiment, leads Marines of Alpha Company, 1st Recruit Training Battalion, during their motivational run at Marine Corps Recruit Depot San Diego, Dec. 11, 2014. The following is the breakdown of each MCRD.